A tempting body powder that makes you look, smell, and taste like a bombshell. This popular Sparkling Lickable Body Powder now comes in a smaller, sleeker (but still sophisticated) box. Unlike juvenile sparklers, this powder, flavored like marshmallow, lends a soft radiance to skin with ultra-fine shimmer and a universally flattering hue. Dusted over collarbones, shoulders, and decollete, this body powder makes skin look glowing and kissable. The gorgeous box makes a stunning addition to any vanity, too. And as always, the puff's luxe ribbon strap makes it easy to hold. 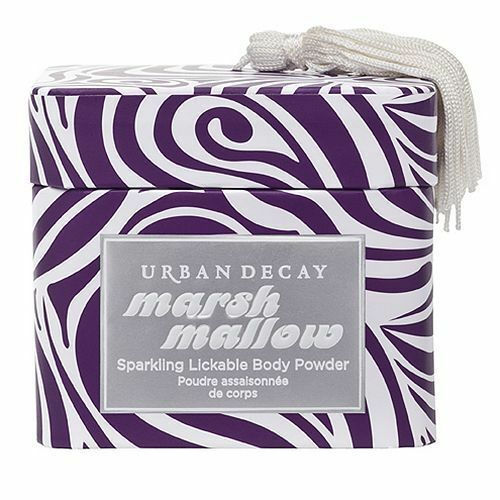 Click the button below to add the Urban Decay Marshmallow Sparkling Lickable Body Powder to your wish list.